Finally, the blog you've all been waiting for, the kind of roadside attraction that inspires a name like Craves, Caves, and Graves: CAVEMAN BBQ. 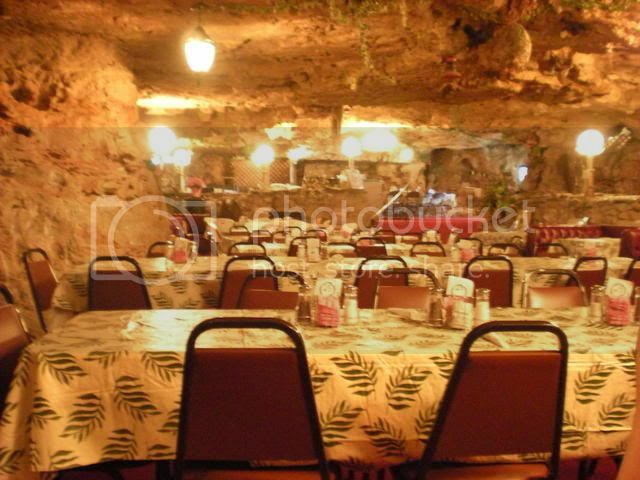 It's a cave, it's a bbq joint, it's in the middle of nowhere, and it is FOR SALE! 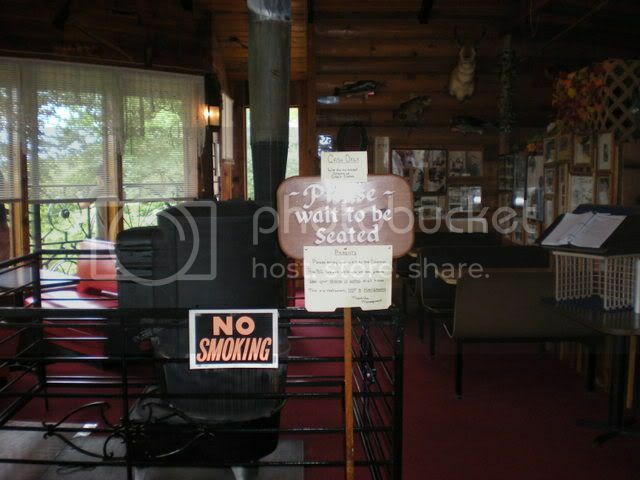 Caveman BBQ is located approximately 150 miles from St Louis. Go west on 44, get off at the Lake of the Ozarks exit, turn right, follow the windy country roads while locals ride your tail for driving a mere 50mph, and don't blink or you'll miss it. Turn right onto Rochester Rd (you'll see a kind of plywood Caveman BBQ tacked up at at angle you'd miss if you weren't already making the turn) and take that pitted gravel road for what seems like 10 miles but is probably more like 3. 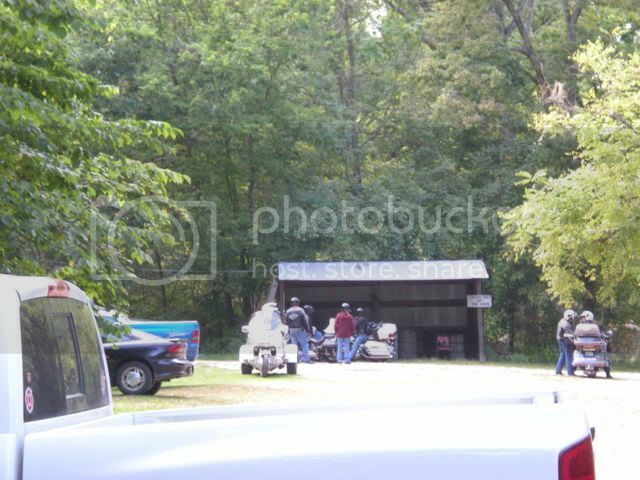 The picture above is the entrance to the parking lot. These entrance/parking lot pictures were taken at the end of the trip, because David Hughes, the owner, is so efficient with the shuttle driving that we were whisked away to the restaurant before we even had time to stretch. First he asked us how we heard about the restaurant (Roadsideamerica.com, to which he responded that he does not own a computer,) and then he told us we need to get together and buy him out. OH, if he only knew! I have been talking about buying Caveman BBQ, sight unseen, for at least two years, possibly three. 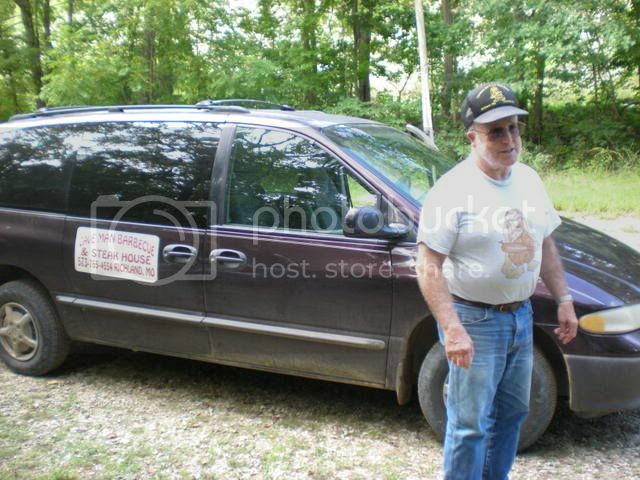 This summer I was determined to scout the place out, and I was joined by Tim, Keith, Aim, Derrick, and Han. We spent the whole trip planning what we would do with the property. First: that County Road, and the road to the restaurant, needs paving, or leveling, or something. At dinner we joked that if we all owned the property, we would draw straws every morning to assign the shuttle driver for the day. I couldn't get pictures as we careened down the gravel road, and didn't even think of the video feature, but I just found the above video on YouTube. The passengers on this trip sound just like we did, with the manic giggling, certain this was the setting for some kind of horror movie. The shuttle drops you off in a porte cochere under the restaurant and you take an elevator up. Along the way he calls his wife on the walkie-talkie to tell her how many he's bringing, and she meets you at the top to seat your party. 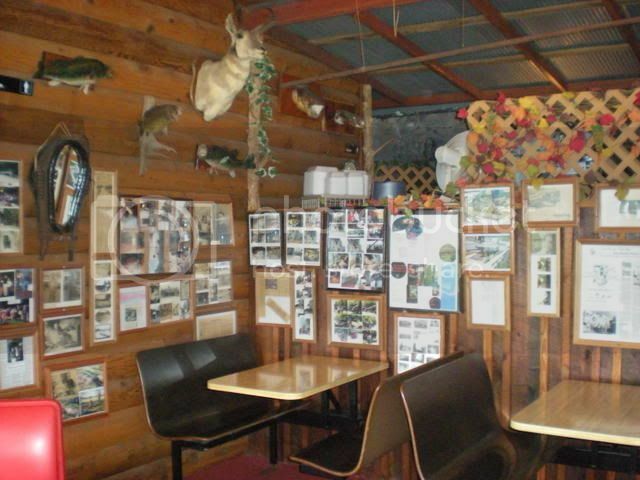 In the "lobby" area of the restaurant there are tons of framed pictures and newspaper articles, along with five three inch, three ring binders of guest book signatures going back to the beginning of the restaurant. After being seated, the waiter took our orders and encouraged us to have a look around. The restaurant is much bigger than we expected (I've read it seats 200-250) and there are ponds, waterfalls, statues, and taxidermy everywhere. 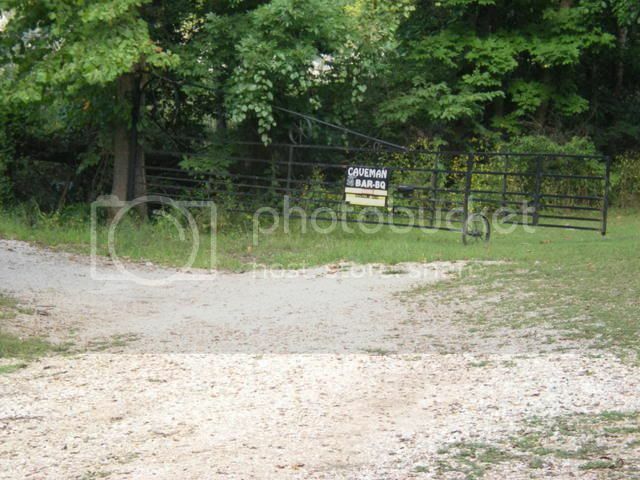 Second suggestion for the property: Advertising. We did not see a single billboard on the way down and Tim has great billboard ideas. 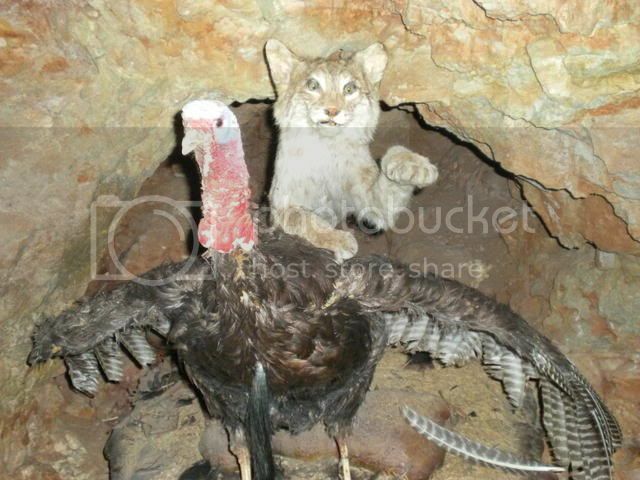 Caveman BBQ: We be clubbin! Caveman BBQ: Bring Your Club, Get Some Grub! It's a good thing Mr Hughes doesn't have a computer, amiright? Third: LIQUOR LICENSE. It's a Steakhouse, for the love! Unfortunately, I've read online that it is intentionally alcohol-free, and he would prefer to sell to someone who will keep it that way. Fourth: Better hours. Right now they are only open noon til 8:45pm, Thursday-Sunday. 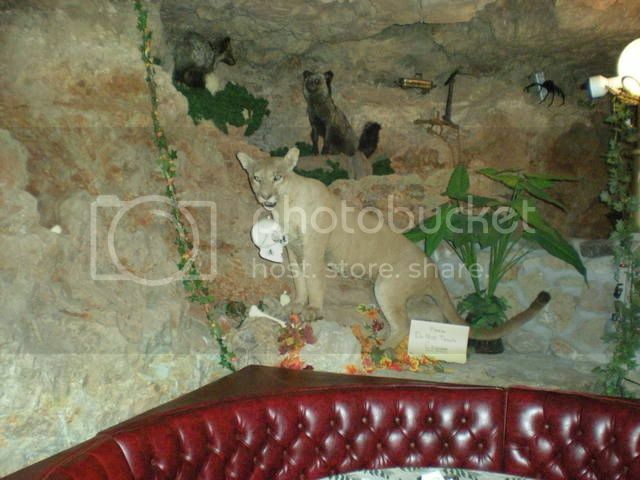 The cave was originally much smaller, and was a speakeasy back in the Prohibition days. 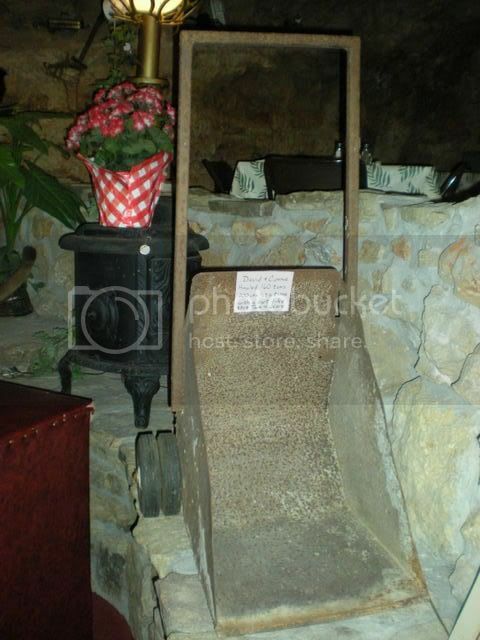 The Hugheses tripled the size of the original cave with a jackhammer, shovels, and wheelbarrows like the one below. In five years, they took out tons (I've read anywhere from 160-2000) of rock, installed carpet, air conditioning, and dehumidifiers. 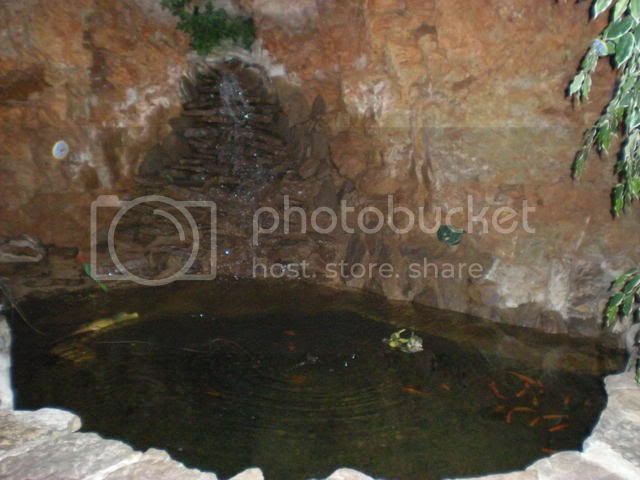 The ponds and waterfalls are man made, as this is now a dry cave. 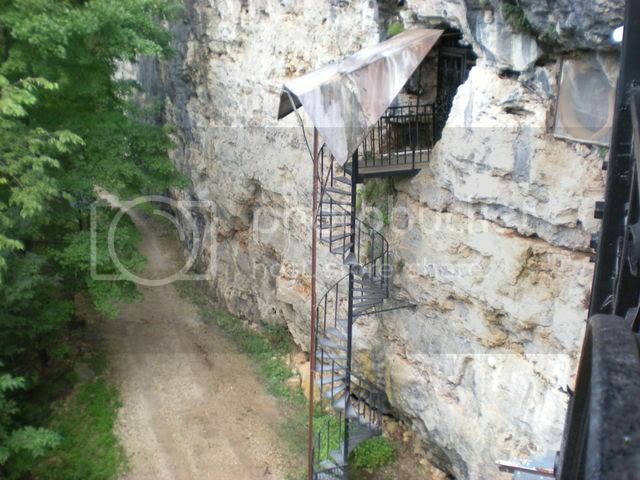 According to Missouri Curiosities, 2nd: Quirky Characters, Roadside Oddities & Other Offbeat Stuff (Curiosities Series) , the water pulled out of the air by the dehumidifiers - nine pounds per hour - is what feeds the waterfalls and ponds. A fifth suggestion: Souvenirs! 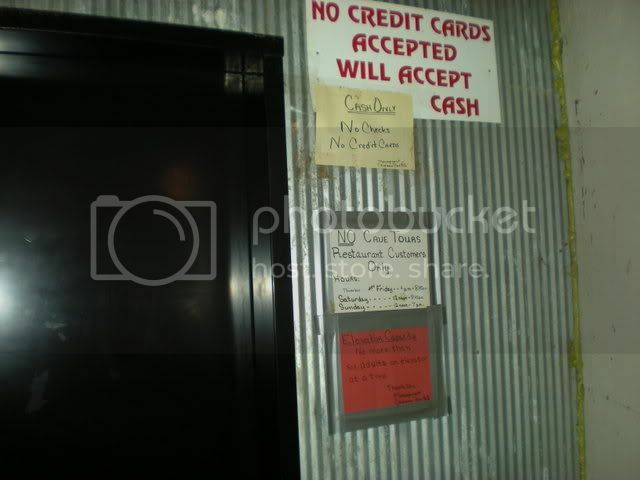 The only thing you can buy that says Caveman BBQ on it is blurry photo "post cards" with the name and address on the back. 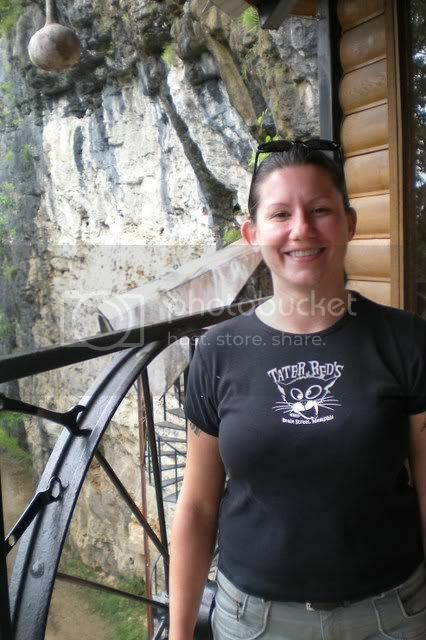 I guarantee nearly every new customer would buy a t-shirt, glass (shot glass or otherwise) or souvenir menu. There's a balcony with spectacular views that wraps around the front lobby area. 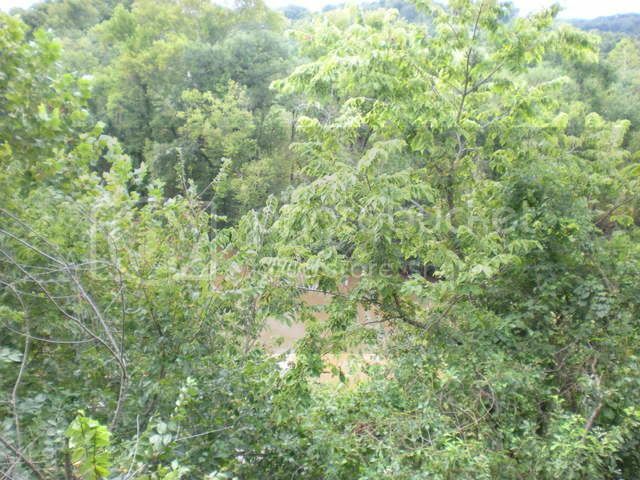 The little bit of muddy water you can see through the trees is the Gasconade River. One surprising part of this trip was finding out that there are NINE cabins on the property. For some reason I thought there were three. They were all built in the 1920s, along with horseshoe pits and a tennis court that are up front by the parking lot. None are currently in use and all are in need of repair. You'll see a few of them on the You Tube video of the drive to the restaurant. Obviously, suggestion number six would be to turn it back into a resort. 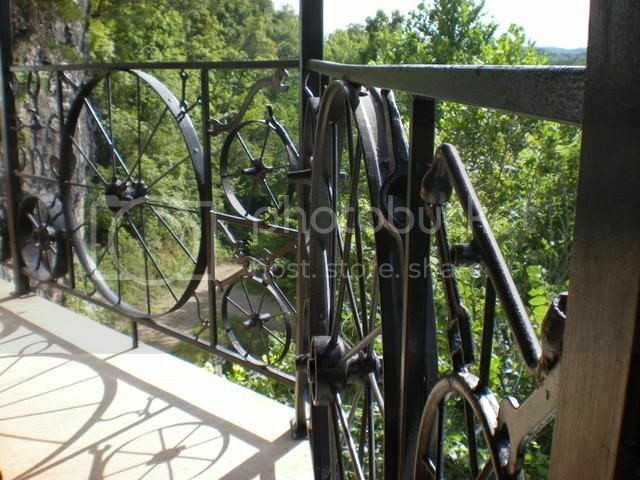 Like all the chandeliers and lamps inside, the balcony decoration comes from various farm implements. OK, so let's talk about the food. 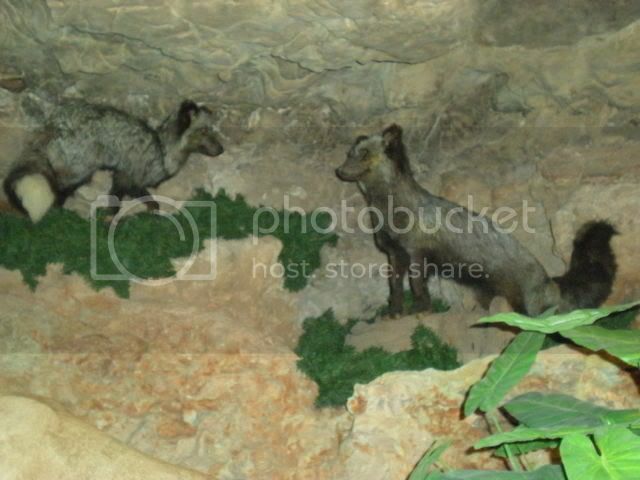 I am AMAZED at how many travel/food review websites say this place is overpriced, the food is mediocre and/or the portions are too small, and that whole eating in a cave experience is not all that great. WHAT IS WRONG WITH AMERICA TODAY? The service was excellent, the food was out at the table so fast it knocked our socks off, and the food was...well, it was pretty good. It wasn't 5 star dining or anything, but it was hot and there was plenty of it, and I thought the prices were pretty average for bbq/steakhouse fare. Particularly since, you know, YOU'RE EATING IN A CAVE. 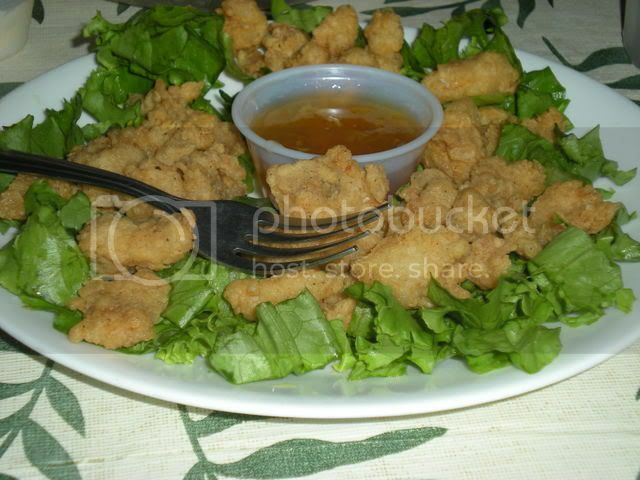 The fried gator appetizer ($7, above) was particularly tasty. I got the bbq brisket, and while it could never measure up to my dad's brisket, it was tasty enough and I thought the portion was reasonable. But then, I don't need to leave a restaurant so full I want to die to feel like I got my money's worth. It came with house salad, fries (or baked potato,) bread, and green beans for about $13. Most everyone else at the table got the 3-meat combo (turkey, ribs, brisket, sausage, or ham) with the same sides and that was about $17. I heard the ribs are pretty tasty, and most everyone agreed we'd like to go back to try the steak. Obviously, I have a history of traveling all over Missouri just for lunch, so maybe my priorities are different. I, for one, think that it's worth driving two hours to eat in this restaurant, and I think my traveling companions would agree. I'm sure we'll go back next year, along with all the people that wish they'd signed on for this trip. After all, the whole aim of Craves, Caves, and Graves is to show you it's worth it to take a detour off the highway! Niki in the Garden was a special exhibit of 40 sculptures by Niki de Saint Phalle at Missouri Botanical Garden in 2008. This was a really awesome exhibit! If you find yourself in Tuscany, check out Niki's Tarot Garden!